Well it’s seven, yes seven, weeks since I tore my Achilles tendon. Last week they took the cast off. Hooray! The partial tear has repaired well and everything is now fully connected. I can now lift my left heel off the ground which I couldn’t before. It was heaven to sleep without the cast. The leg looked awful after the cast came off – red, swollen, very sore to the touch and no muscle tone at all. Most of this has improved in the last week when I’ve been in my “ski boot”. It is set at 20 degrees to elevate the heel and protect the newly repaired tendon. That’s what the dial on the ankle is for. It should go down to 10 degrees next week if all goes well. I’m still house bound but I can walk more naturally in the boot as I’m allowed to bear part of my weight on my left leg. This was forbidden when I was in the cast. Today I had my first appointment with the physio and I now have a series of stretching exercises and a few early weight bearing toe raises to do three times a day. Now the “rehab” has started I feel that life is moving on and things are on the up. 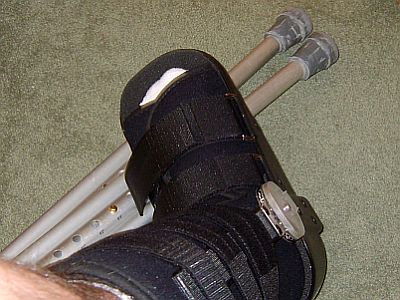 My aim is to be walking without the boot before Christmas. Here goes. Take it easy and go steady Martin. Can you paint again yet? I'm hoping to have a painting session this weekend. Fingers crossed.